Don Airey was quickly replaced by the classically trained David Rosenthal. The new line-up - which turned out to be the longest lived of all - recorded their new album in Canada, the first time the band had used a studio outside Europe. The distinctly AOR-flavoured "Straight Between The Eyes", released in April 1982, followed a similar pattern to the previous LP. It reached #5 in the UK album charts and broke into the American top 30 for the first time since "Ritchie Blackmore's Rainbow" in 1975. Yet another strong single, the Foreigner influenced "Stone Cold", failed to make the desired impact in the UK, but in the USA (where it seemed squarely aimed), it did gain a measure of ground by reaching the top 40. It was followed by further American tours (with one show being filmed for a video release) - though this album was not toured in Britain. The band did almost fold in 1983 when a Deep Purple reunion looked set to happen, but nobody could agree on the details and it was put on hold. Rondinelli left, being replaced by another American drummer for the last nine months of the band's life. Chuck Burgi had actually been working on Glover's solo album, and after Rondinelli was asked to leave, he seemed an ideal choice. The final Rainbow album for now was "Bent Out Of Shape" (UK #11), recorded earlier in the year (in Denmark) and issued in August 1983 in time for a tour (including some UK shows - some of which were recorded). Though a long way removed from "Rainbow Rising", the album did have more guitar and a brasher edge to it. It also contained one of their most commercial compositions, "Street Of Dreams", which surprisingly didn't sell as well as earlier singles, failing to reach the top 50 in either the US or the UK. Glover produced the LP again but didn't help with the writing. The off-on Deep Purple reunion was finally agreed and Rainbow played their final shows in Japan in March 1984, including a special one with orchestral arrangements for "Difficult To Cure", Blackmore's Beethoven party-piece (the show was filmed and issued in part in Japan but nowhere else). 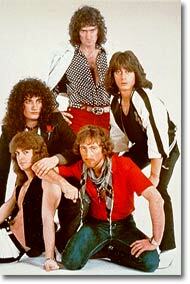 It is generally felt that originally Blackmore was to do an album and a tour and then return to Rainbow, certainly this is what Joe Lynn Turner was told. 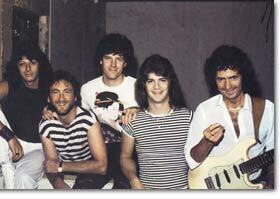 Instead it wasn't until 1993 that Rainbow reconvened, after Blackmore quit Deep Purple for the second time. When Rainbow was reformed in 1994/95 the only previous member onboard was Chuck Burgi. David Rosenthal initially toured with Little Steven after Rainbow split, and is currently touring (along with Chuck Burgi) in Billy Joel's band. Joe Lynn Turner was drafted into Deep Purple in late 1989, at a time when Blackmore was pushing the band towards the AOR style of latterday Rainbow. Some riffs from "Bent Out Of Shape" were re-used on Deep Purple's 'The Battle Rages On' album. The remastered CD versions of the studio albums do not contain bonus tracks. The live b-side of 'Power' was from the 'Live Between The Eyes' video soundtrack, and also appeared on the 1985 'Finyl Vinyl' collection, now available as a double CD. The 'Finyl Vinyl' CD also includes tracks from the final show, in Tokyo 1984, one of which is an orchestrated 'Difficult To Cure'. Another, 'Street Of Dreams', was originally only on the cassette version of the album. The powerful 1983 live b-sides 'All Night Long' and 'Stranded' (apparently recorded at a Cardiff soundcheck) are not available on CD. Completing The Collection: Both the Mk 7 live video 'Live Between The Eyes' and Mk 8 'Japan Tour 1984' have been pirated on DVD from the 1980s LaserDisc versions (neither of which included extra material). They are not available officially on DVD. 'Japan Tour 1984' was a Japanese only release, although two tracks from it appeared on the 'Final Cut' video in 1985 ( never officially available on DVD outside Japan). 'Final Cut' also included four Mk 7-8 promo videos. Rainbow Mk7-8 at www.deep-purple.net contd.